A Directors UK report has highlighted the significant under-employment and under-representation of black, Asian, and minority ethnic (BAME) directors in UK television production. The report, UK Television – Adjusting The Colour Balance BAME Directors Working in UK Television Production is the result of research into the current employment rate of BAME directors across all programme genres in UK television. The research found that only 1.5 per cent of programmes were made by a BAME director, while BAME directors make up just 3.5 per cent of the directing community. 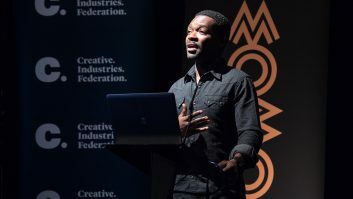 The research also found that BAME directors are being given a far smaller proportion of directing opportunities in many key programme genres than their white counterparts. Some of the most popular drama, comedy and entertainment shows in the sample had never been made by a director who is Black, Asian or Minority Ethnic, including all programmes within period drama, chat shows, game shows, performance, reality, panel shows, sketch shows, children’s comedy and children’s entertainment. The data, collated from a large sample of programmes broadcast up to the end of 2013, also showed that the proportion of television being made by BAME television directors in the UK had got worse over time, decreasing by over 20 per cent between pre-2011 and 2013. Directors UK’s ambition is to work with broadcasters, production companies, agents and training providers to bring about a significant increase in the number of television programmes being made by BAME directors.